I say I’m from Florida, because that’s where I was when I was 15, and I consider that to be my most awkward year. But really, my family moved around a lot – DC, Arizona, Florida – every seven years we moved. If it was really for Witness Relocation, my parents did a good job of hiding it. What attracted you to Lowell? The audiences of MRT. Very few other audiences in the country are invested in their theatre as a whole. Usually you see people attending based on whether they know the title of not. Not here. Charles Towers did a fantastic job of attracting an audience that is game for new stories and new experiences. That’s actually incredibly rare in the American Theatre. Where did you receive your education/training? I went to Florida State University, but most of my actual education came from co-founding my own theatre company at 22 with eight of my friends, and running it for 10 years. We had to learn on the job and luckily enough that theatre, Dad’s Garage Theatre Company, celebrated its 20-year anniversary this summer. 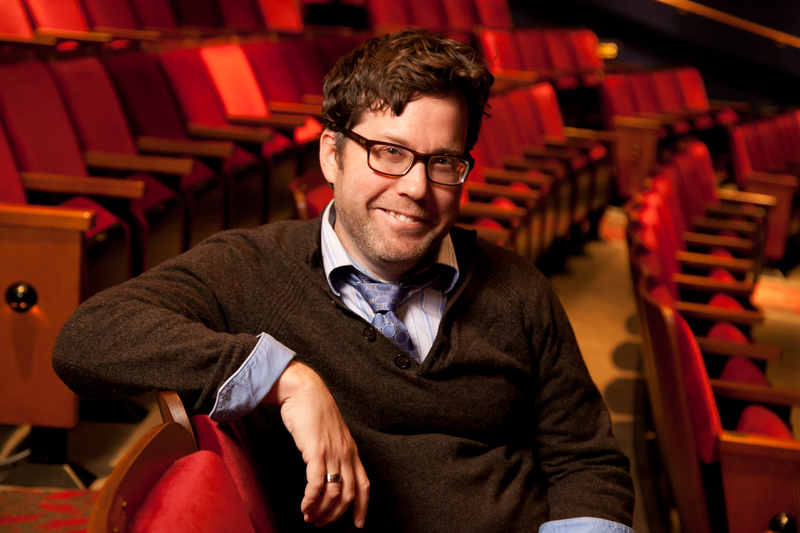 After I left Dad’s Garage, I went on to be the Associate Artistic Director/Resident Director at California Shakespeare Theatre, then the Tony-Award-winning Actors Theatre of Louisville, and then Geva Theatre. Each stop has been a real education in how you develop new work and connect your theatre to your community. How’d you get into the theater biz? It’s slightly embarrassing. As a very small child, my parents took me to Joseph and the Amazing Technicolor Dreamcoat and I wept and cried and screamed and loved it. I left wanting to be an artist. Also, on principal, I have never watched that musical since as I have a sneaking suspicion it will never be as good as it was in my 6- year-old brain. I feel like the most revolutionary act right now is to turn off your phone and go sit in the dark and listen to someone else’s story for 2 hours – to try to understand the world from someone else’s point of view. So, I get to be a revolutionary. That rocks. I have a few. I was working on a show that Graham Chapman had written and Michael Palin. And then John Cleese called me up one day to wish me luck on it. Later Palin called before opening and left the greatest voicemail message of all time. Another time, I was doing a show about Jimmy Carter, and Jimmy Carter showed up. At intermission he went around and shook everyone’s hand and thanked them for supporting the arts. Then there was a show I opened at Manhattan Theatre Club this year that got great reviews and then transferred to the West End in London at the end of the summer (and later was named the #1 London Musical of the Year). When you’re a kid you always dream that you’ll be doing that kind of thing, and when it happens you have to remind yourself to not smile all the time and at least pretend like you’ve done this sort of thing before. And yes, I ate fish and chips pretty constantly. Favorite show you worked on and why? I co-wrote and directed a show about the science of rock and roll with some friends that premiered at Actors Theatre of Louisville (which is known for the Humana Festival of New American Plays). My father, who loved music, had Parkinsons and a chunk of the show was about how music helped to ease his symptoms and adjust his brain chemistry. Even though it was very tough on him, he made it to the opening. At the end, instead of just applauding, he threw his walker at the stage. It was maybe his greatest rock and roll moment ever. One thing that would surprise people about your job? I spend a lot of time directing and a lot of time setting up systems for audience members to get closer to the art itself. I’m always proud of hit shows, but I’m equally proud of the audience engagement efforts we developed at Geva, mainly the Cohort Club, which received national press on being an innovative way to connect community members to the work. I can’t wait to bring it to MRT. I’m a big fan of the art form, and I love it when I help someone else to fall in love with it as well. You have a big music background, what’s currently on your personal playlist?D’Aneglo’s album – it makes the world seem a bit warmer. What do you like to do for entertainment when you’re off work? Moderation has never been my strong suit – so I either binge watch Netflix at home, or I try to travel out of the country whenever I have a free moment. So, this past weekend was all of Black Mirror, and the weekend before was Jamaica. That’s about how it usually goes. Who is your hero in the arts and why? Actually my parents, because they grew up going to the theatre and galleries and independent movies, and when my brothers and I were born, they made sure that we all went to as many art events as we could. It was only later that I realized that other families didn’t go to the theatre all the time, and that arts education stopped shortly after 7th grade. So my hero is my parents, and every parent who wants to make sure that arts remain an important tool in how their child develops into an empathetic human being. Favorite quote from the stage? My favorite quote is: “Mistakes are the portals of discovery” – which isn’t really from the stage as it’s James Joyce – but seriously, whose gonna say no to a James Joyce quote? If you could time travel 10 years into the future, where would you hope to see your future self? I hope I’m somewhere getting my haircut, because that would mean I still have enough to need constant maintenance.